I'm really interested in vows and taboos in relation to the granting of power. One of my favorite stories of all time is that of Samson, chosen of God to be a freaking superhero, as long as he observes a few prohibitions. The Nazirite vow of not touching unclean things would include, you know, stuff like jawbones and lion carcasses. 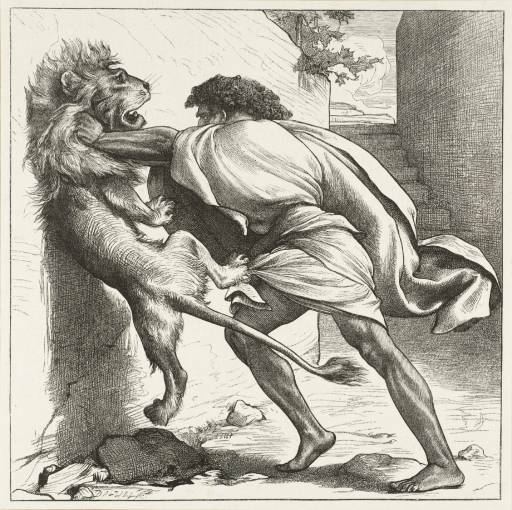 So even as he's fulfilling God's mission Samson breaks these prohibitions and loses his power. These seem ripe to be incorporated into an old school adventure game. Whether they be a fate-like prediction given to the character at creation, "He will never _______ until ________," or a kind of self imposed spiritual restriction, "I shall never _____," these could add the flavor of folklore and religion to play. But more interestingly to me, they could function as an ongoing and individualized player mini-game. Yeah it would be fun for a player to have a power, but it would be more fun if they have to be on their toes to keep it. Now, the powers a character might gain from observance of these strictures would be a tricky thing; we don't want every pc running around super strong or immortal. Before we try to come up with possibilities let's narrow it down a little. I'm thinking these benefits might be better as a continuous power (i.e. strength, great size) and not daily powers or spells. It also might be better if they were just one clear benefit and not many. Both of these would make it more obvious and dramatic if the strictures are broken and the power is lost. I'm thinking it might be better if it is limited to affecting them and their body. Not something like pyrokinesis. But I'm less sure about that. I feel like these could also be more interesting and flavorful if they were slightly ambiguous or had room for interpretation. You know, like "can never be killed by man born of woman." And then MacDuff of the Cesarean shows up. I think the magnitude of the power granted should be balanced with the difficulty of keeping the vows. And this is related to picking vows that would work mechanically in-game. For example, an ascetic vow of vegetarianism, or a vow to avoid alcohol would rarely be an issue to an old school character unless the DM or player consciously made it one. I'd like something a little harder to avoid. To help us generate we can think of them as obligations, things the character must do, and prohibitions, things they must never do. My general feeling is that the latter would be easier to use for our purposes but let's go with it for now and see what we can come up with. I'm thinking this might need some more thought and a second post. But I'm curious to know what you think. It's a great idea. There was a similar concept in a d20 Arthurian game called Legends of Excalibur by Charles Rice called Fate and Destiny. The player can determine his fate while the GM secretly determines his destiny. Every time a player spends a fate point to modify a dice roll, the GM gets a destiny point to spend on a dice roll that pushes him toward his ultimate destiny. I have no idea how this would work out in play, but the idea is interesting. This concept is also represented in the paladin class who lose their powers and become fighters when they break vows. What if HPL Lived Through the 1960s?